Introducing the new Cool Air Edition - Sleep cool & dry on a cloud of air! It's a ventilated memory foam core with a mesh layer top and soft quilted cover. Learn more here. 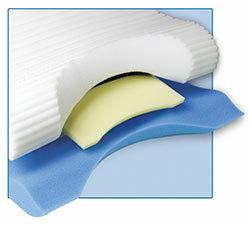 The top layer is a ribbed memory foam which allows air to circulate while quickly adjusting to your body temperature and molding to the unique shape of your head and neck. The exclusive lobed shape of the pillow and the crescent shaped neck cutout supports your head and neck without shoulder or back strain! This pillow is ideal for back and side sleepers. It actually encourages proper sleeping positions and helps keep you there. Ordinary pillows don't properly support your head and neck, forcing your neck into unnatural, potentially harmful positions. Sleeping in an unsupported manner can cause the surrounding muscles in your neck and upper back to work harder which can result in a stiff, achy morning! 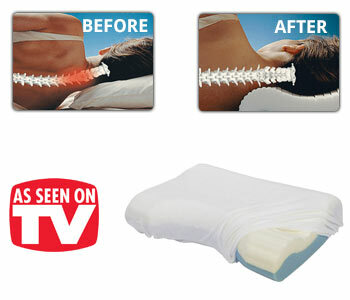 The Contour Cloud® Pillow helps support and align the neck and spine. Your head, neck, shoulders and back "sense" the support and relax so you enjoy a deep, restful night's sleep and awake feeling refreshed and rejuvenated. Your pillow comes with a custom fitted velour cover. It provides a soft sleep surface which compliments the pillow. Additional covers are available . Upgrade To The New Contour Cloud Air Edition! Contour Cloud Pillow: Cool Air Edition. Imagine resting your head on a cool, cushiony cloud of air! Contour’s 3-layer design keeps back and side sleepers cool and dry with a ventilated memory foam core, a top layer of cooling, air-circulating mesh and a soft, breathable cover that wicks away moisture! I've been using this pillow for years. Works great with my neck and shoulder issues. The curve is great for side sleeping and the solid side when I sleep on my back. Contour Cloud Cervical Pillow is my personal pick for my patients. 99% of my patients who has neck issues (and/or back issue) likes it. I myself have been sleeping with this pillow for at least 12 years. I am on my second one now for at least 5-6 years. My husband and kids also use it. What I like about it is that its 3 support layer feature design give support and align the neck and spine well (See Description for details). It is not too soft, but not too firm neither. Most of my patients who has neck pain reported that it is hard at first because everyone is used to sleep with a soft pillow. However, after awhile they found that they have less or no neck pain and can sleep better at night. It is also affordable to most people. I am a Doctor of Osteopathic Medicine (D.O.) practice Osteopathic Manipulative Medicine and Treatment (OMM/OMT). And I approve it! Only sold in one size, you have to stay in one place you can't move. I've been using this pillow for 2 weeks now and have had no neck pain upon waking. The only complaint that I have is that it's not a full size standard pillow. It's small. I like the way he cradles my head. Just love the pillow will never go to a different pillow again !!!!!!!!! I have been using this pillow for about 20 years and I love it!